Our first morning in Chiang Mai, we had stopped by a little restaurant called Eing’s and ordeed some delicious breakfast omelets. It was fantastic, and the next morning we came back for more Thai deliciousness. Over the course of the couple days, we befriended the owner of the shop – a quick-witted, fiery little Thai woman named Eing. She spoke great English, and the three of us became fast friends. 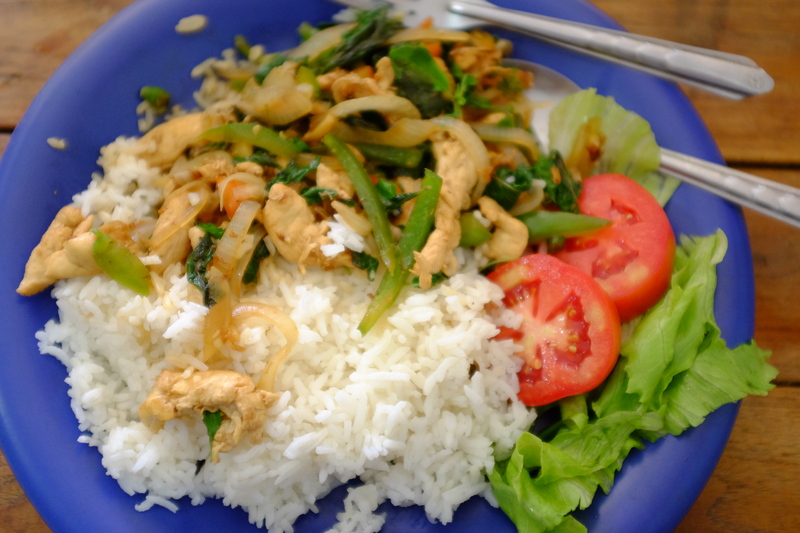 After devouring another delicious meal, I half-jokingly asked Eing if she would teach me to make my favorite Thai dish, and favorite dish in general, Kaprao (Basil Chicken). Thinking I was kidding, she sarcastically said something to the extent of “sure, sure”, but after some persistence, I actually convinced her to agree to a lesson the following day! The next morning, Jason and I headed over to Eing for our daily breakfast routine, along with our new friend Johnathon from the guesthouse. True to her word, Eing began bringing all of the ingredients to make Basil chicken out as we arrived, and the cooking class had begun! Johnathon asked if he could join as well, and Eing kindly agreed to let him cook his meal as well. Photos below! Since I first tried basil chicken as a kid, I had wanted to learn how to cook the dish – learning from Eing made for an authentic, fun, and simply perfect experience that I will never forget. Thanks for everything, Eing – I cannot wait until we meet again!